Be sure that you save your Dragon install files to a safe location, along with including your Dragon serial number. We strongly advise that you save it to a USB thumb drive, or an external drive. Saving these to your desktop or to your boot drive is inadvisable because if your system crashes and you have to reinstall Windows, you may lose those files. Don’t attempt to install Dragon on other than your boot drive (C drive). Most of the program files and some common files will be installed on your C drive regardless. These cannot be moved or installed anywhere but on your boot drive. The largest portion of Dragon is/are your user profile(s). You can always move these to a secondary drive or other location if you so desire. You can also load and run your user profiles from external drives and/or USB thumb drives as long as they are of sufficient size. Also, make sure that you are using a C drive with sufficient disk space. Your C drive should be no smaller than 256 GB, and preferably 512 GB or larger. We recommend solid-state drives (SSD). SSD’s will not increase the performance or accuracy of Dragon, but they will allow both Windows and Dragon to load faster. Keep in mind that Dragon runs completely in memory (RAM), so installing and using an SSD will not make Dragon run faster. You need at least 120 GB of free space on your C drive for Windows and applications, such as Dragon, to load and run properly. Just keep in mind that if you run out of drive space, you will run into problems running applications and Windows, most specifically Dragon. If you are going to change the default settings for the Windows system restore points, be careful that you don’t assign excessive disk space to such. Doing so will quickly eat up your drive space. Either leave the Windows system restore settings as they are by default, or disable such. Keep in mind that using the Windows system restore feature to recover from problems with Dragon is ill advised because it can, and will, because your user profile(s) to fail to load if you’re restore point is too far back in time. If you intend to engage the Windows system restore to resolve problems with Windows and/or Dragon, be sure that you export your user profile before doing so. That way you can simply reimport such to get your profile(s) functioning properly after a restore. We strongly advise that users have a minimum of 8 GB of RAM (Windows 64-bit) and preferably 16 GB or better. Avoid using 32-bit versions of Windows. 32-bit Windows restrict you to 4 GB of RAM maximum, and, with regard to Windows 7, less. Having or using only 4 GB of RAM can slow Dragon down to a crawl because, if you load too many applications, Windows will have to swap them out to the pagefile when RAM must be freed up. If this happens with Dragon, you can see latency issues up to 1 to 2 minutes cropping up. Just not a good idea to have less than 8 GB of RAM on your system, as well as having access to such by using Windows 64-bit versions. If you have a previous version of Dragon installed, Never install a newer version of Dragon over top of a previous version without first uninstalling the previous version. This applies to installing any newer version of Dragon when a previous version is currently installed, but is particularly true regarding Dragon Professional Individual 15 (DPI 15). The reason for this is that you can never guarantee that Dragon Professional Individual 15 (DPI 15), or any version of Dragon newer than your current one, will properly uninstall when installing a new version of Dragon over top of an older one. All too often this can result in disaster (i.e., a corrupted install and/or failure to run properly). This page is an excerpt from VoiceComputer's installation lesson. While you can export your user profile from your currently installed version of Dragon before upgrading to a newer version, NEVER rely on your newer version of Dragon, after installing, being able to properly upgrade your previous Dragon user profile. Sometimes it works, and sometimes it does not. ALWAYS export your custom vocabulary and/or custom commands in addition to exporting your previous version user profile. This will ensure that you have access to your custom words and/or custom commands should upgrading your previous version user profile fail. Note that if the conversion (upgrade) of your previous version user profile fails, it is most likely due to profile corruption, which may or may not be evident, and will probably be unrecoverable. The rule of thumb is redundancy. Follow this rule if you want to avoid ending up kicking yourself. Note, if you are upgrading and your previous version of Dragon (installed version) is Dragon Home, be aware of the limitations on exporting and importing profiles and custom vocabulary. In the Home versions you cannot export your user profile and you have limited or no access to exporting your custom vocabulary. Basically, you should treat any version of DNS Home as requiring starting over from scratch. That is, you will likely have to reenter and reset any custom vocabulary anyway. Just be prepared for all the limitations associated with DNS Home. If, for whatever reason, you wish to return to your previous version of Dragon, be sure that you uninstall your current version while connected to the Internet so as to preserve your activations. Should you experience any problems after upgrading from an older version of Dragon to a new one, particularly with regard to DPI 15, don’t try to beat it to death to get it to work. Simply uninstall it, run the Dragon remove utility, reboot your system and reinstall. If you follow the instructions above, your installation of Dragon will more likely than not be successful. Make sure that there are no pending updates to Windows that have not been installed and be sure to reboot your system after Windows updates. This is particularly true if you using Windows 10 because pending updates may prevent Dragon from installing properly or at all. This rule of thumb applies generally to all software. Some users have reported problems with Dragon and/or Dragon installations, specifically DPI 15, after installing the Windows 10 Creators update. Problems include issues with activation and failure of Dragon to install or run properly. DPI 15 is fully compatible with the Windows 10 Creators update. Make sure that all applications are properly shut down before installing the Windows 10 Creators update and make sure that you follow the instructions for rebooting your system. Some will say that keeping your system clean, particularly with regard to the Windows system registry, isn’t necessary in later versions of Windows (i.e., Windows 7/8.1/10). To some extent this is true. However, Windows does not clean up after itself in all cases. The Windows system registry can become cluttered with all kinds of outdated entries that can slow your system down to a crawl over time, as well as cause problems with software installations. Anyone who doesn’t think this is true, consider the fact that even when you uninstall an application, the only files, folders, and registry entries that are uninstalled are those that were created when you installed the software. Anything added to the Windows registry post install is not automatically removed when you uninstall. Also, there is no method for Windows to uninstall entries related to files and/or folders that you personally have created. These will continue to build up over time making the Windows system registry excessively large. It may not be necessary to clean the Windows system registry in some cases. For example, Windows automatically install certain entries for all versions of Microsoft Office that are supported under the current version of Windows. It is not necessary to clean these types of registry entries, but every time that you create a new Microsoft Word document or Microsoft Excel spreadsheet, or document in any word processor or text editor and then delete such, these entries remain in the Windows system registry and Windows does not clean up after itself in these cases. It is generally not a bad idea to periodically use programs like CCleaner to help Windows clean up after itself. Nonetheless, be careful using these types of utilities when cleaning up your system or the Windows system registry. They can be very helpful, but they can also be tricky and cause problems used incorrectly. Make sure that you understand whatever utility you choose to use. However, CCleaner is one of the best, understood and used correctly. Beginning with DPI 14, Nuance no longer provides you with the means of extracting the full set of installation files if you purchase the download version. The installation is done directly from Nuance’s FTP site. As such, you will not have the option of repairing Dragon from the Windows Control Panel | Programs and Features. The Change option will not be available. 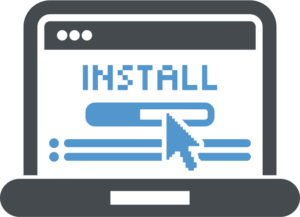 However, if you go to the location where you saved the download file and simply double-click on it (re-execute), you will accomplish the same as if you were able to run a Repair from the Windows Control Panel | Programs and Features. If you purchased Dragon as a “smart upgrade” and you have forgotten or lost your previous version serial number, you can contact us (info@voiceteach.com) and we will help you get Dragon installed. Smart upgrades are those that require a previous upgradable version of Dragon (serial number) in order to activate Dragon. Regardless, be sure you heed the instructions above for uninstalling your previous version before installing any new version of Dragon.